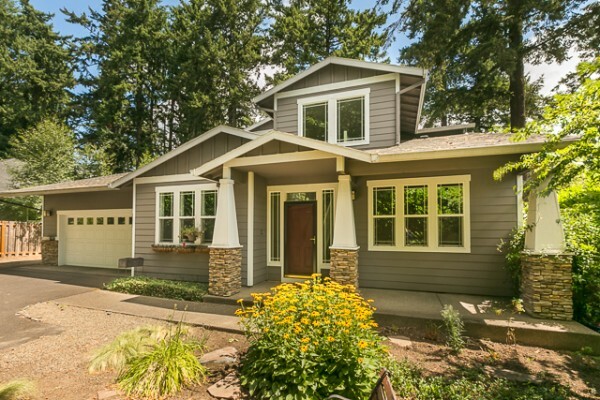 If you are interested in Lake Oswego real estate, then you are usually interested in golfing, schools, boating, or all three. The Country Club is a huge asset to the community and the desirability of living here. Tucked in around the towering evergreen trees and off Country Club Road in the North Shore – Country Club District is The Oswego Lake Country Club. Walking distance from FIRST ADDITION Neighborhood. Since 1924 the Oak trees, Douglas Fir and Maple trees have provided paradise for golfers on the par 71 course. Skill and golf pride is truly felt in the fairways at OLCC. The Audubon Society recognized this club with the award for responsible stewardship. There are real grass practice grounds at the driving range with target greens. The practice bunkers and the short-game practice area is all professional. U.S. Amateur Champion Chandler Egan designed the original golf course and there’s no doubt he put a tremendous amount of thought into creating OLCC. Mr. Egan also played a vital part in reworking the links at Pebble Beach back in 1922 and most of us know PB is on most golfers short list to play one day. Oswego Lake Club membership is an important part of maintaining the quality of play at OLCC. Golf course maintenance is not inexpensive. A large staff is paramount in assisting that everything come together. Please contact the club office for more details on membership but here’s a brief outline. The social membership allows members to use club dining facilities, swimming pool, snack bars and participate in club functions. This level of membership allows use of the driving range and practice facilities and social status invites you to compete in in two-ball events. Proprietary membership opens up members to full club access! The course and range are available to use and there are voting privileges on initiatives that are raised by the club board and its committees. All facilities, events and amenities including junior programs are open to OLCC members at the proprietary level. OLCC prints a member news magazine called TEE TALK. It highlights events on the club calendar and is a showcase for Men’s and Woman’s Club Champion and Senior Champions with pictures of winners. The magazine also features letters from the club president and reports from the greens department. Here, Golf Course Superintendent Bob Senseman can share his experience on water drainage issues, course sand and divot action and seeding the grass. Another important aspect of fairway playability is the schedule for verifying the course and closures while the grounds settle back down. To many folks this is to much talk about dirt and grass and to the golfers following closely it makes a lot of sense and we take pride in the conditions of the club. Monthly dues are important as well as the costs for capital improvement. Over the years alterations have been made to Oswego Lake Country Club. The course changed in dramatic ways in the 1950’s when the layout was updated. New tees are added in 1993 and fairways were improved to allow better drainage. Greens were enhanced and remain fast and near highest standards in the sport. What a great place to play where you live. The CC motto is Live Where You Play and for 90 years members have called the OLCC an extension of their own homes. The clubhouse has museum quality golf memorabilia displayed within the landmarks walls. The property promotes comfort and class without being uptight and closed minded. In order to continue the success of these standards there are accommodating membership rates for applicants under age 39. This approach to membership promotes generations of contact with Lake Oswego’s pride in golf. Please contact Tiffany Smith the membership assistant to learn more about the comforts OLCC offers. She can be reached at 503.636.3631. Schedule a tour of the neighborhood! We are very excited about our Lake Oswego Schools Foundation support! We look forward to writing donation checks to the Lake Oswego Schoools Foundation and are excited to support this great foundation that actually makes a huge difference for our schools! Welcome Lake Oswego Based Real Estate Broker Brian Olsen to our Portland Cooper Jacobs Real Estate Branch! Cooper Jacobs Real Estate offers a great package of perks and prides itself as being one of the most tech savvy brokerages in the Pacific Northwest. We have three offices across Seattle and Portland and our Brokers pride themselves on excellent customer service. We use the combination of tech skills and high level of customer service to benefit our many satisfied and repeat clients and look forward to working with you, too!